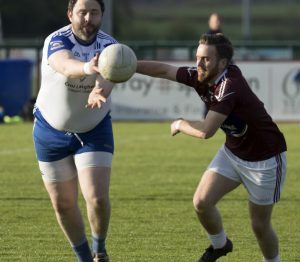 Kildare Nationalist — Robertstown on course for JFC semi-finals but who will join them? » Robertstown on course for JFC semi-finals but who will join them? Robertstown on course for JFC semi-finals but who will join them? AFTER Milltown and Rheban were confirmed as the qualifiers for the Junior Football Championship semi-finals from Group A last week, Group B will be settled this Thursday evening. Robertstown have racked up dominating wins so far against Ballykelly and Castlemitchell and anything other than a repeat of that against Cappagh to complete a 100% record in the groups would be a big surprise.